Let me introduce myself. My name is Marjo and I was born in 1974. I'm married to Teemu. Our house is full of action and traffic. Besides Nancy, Kiia, Super, Brie and Chili, we have four children. My oldest, Milja (born in 1994), studies in Kuopio and thus is no more living with us. Our elder son, Elias, was born 12 years later in 2006. Our middle son, Tuomas, was born in 2009 and our youngest son, Luukas, was born in the beginning of the year 2012. As a child I used to take out my neighbour's dogs every day. When I was in high school, we had three Dobermanns in our house. In those days, in addition to taking out our dogs, I was doing theatre, photography, swimming, martial arts (kick-boxing and tae kwon do) and reading. In 2000, I graduated from the University of Jyväskylä and I am a language teacher (English, French and Italian) by profession. In Spring 2016 I got my second university degree, this time in social sciences. We moved to Laukaa in 2006 and have been enjoying our lives here ever since. Since 2008 I have been an active trainer of obedience in our local club. I also organise obedience shows once or twice a year. 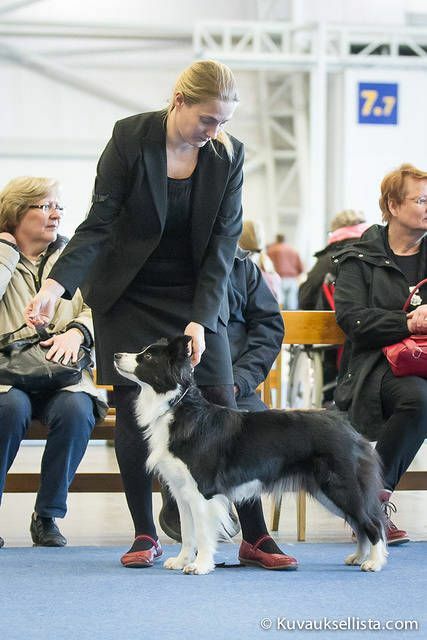 In Spring 2016 I was qualified as an obedience judge.